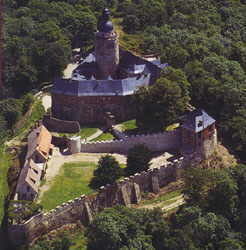 Welcome the Medieval Castle Builders Project Directory, this is a Lübeck Haus castle construction project site. This web site is a part of the family of web sites owned and operated by Lübeck Haus. This site is a source of stone masonry and timber working tools and equipment. 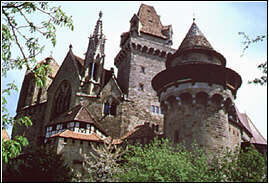 Additionally we provide medieval castle construction information, castle books, stone masonry books, building with timber books, and general building construction books, castle photos, project ideas, and additional help for those brave and daring builders who are planning to build, are building, or perhaps, do own and maintain a medieval castle. This site will strive to provide an information source for stone masons and castle builders, and with which will help to begin to build a castle. We are talking full size stone and timber medieval castles designed and patterned after existing castles in Europe. You know the kind that puts shivers down your back when you go into them. Sometimes you can sense the history in one of these architectural masterpieces. Or perhaps something else. If you have stayed for any length of time in one, you know what I mean. Up until now our stone and timber workshop, Old Castle Shop, was the source of castle ideas, castle links, castle books, castle plans, construction ideas, terminology, planning ideas, and other information. Old Castle Shop will continue to do so. The workshop web site can be accessed by clicking on Old Castle Shop . This web site will not replace our workshop one, but both will work together on any castle, masonry, or timberframing project. We are planning to build and are laying the ground work for a mid size castle to be built in the State of Washington. This full size stone and timber castle will be built along the style of a medieval period castle that could be found today in the Alps Mountain region of Europe. This castle will be of the Burg configeration rather than that of a Schloss. We will not copy any particular existing castle, but will design this castle from the ground up. However, it definitely will appear as a medieval castle, will have the features and capabilities of one, and could easily function as a working castle at any time during the medieval period. But like all of our castles, designed and built for modern living. 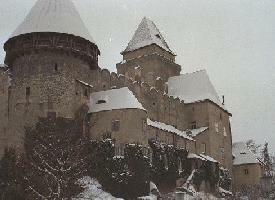 For a brief pictoral of our favorite castle, Click Here . When you are planning for your next masonry, timberframing, or boulder landscaping project and you need a few good books, visit one of our bookstores. When you need to get some good structural and civil engineering books, construction books, building with stone, stone masonry, timberframing books, castle books, or a video on castles, plus construction tools and equipment, go to our main store and bookstore, Lübeck Haus. Several pertinent book categories links to our bookstore are below for your convenience. on castles, masonry construction, timberframing, and engineering. The books in these categories of books are available at Lübeck Haus Bookstore and are recommended reading. These links go directly to Lübeck Haus Bookstore. Click on the category of your choice, then select your book. To read more about that book, click on the book title. Then follow instructions to complete your purchase. Reference books, Atlases, & Encyclopedias. Select from dozens of stone and brick masonry tools, including bricklayers hammers, stone mason sledges, stone splitting wedges, slab spitters, rock picks, pneumatic stone carving hammers, and much more. Select additional masonry tools, including Stainless Steel Masonry Trowels, Chisels, Hammers, 48" Masonry Levels, Paver Extracting Tongs, powered masonry saws, Masonry Grinding Wheels, Masonry Drill Bit Sets, Masonry Drill Bit, Carbide-Tipped Spiral Drill Bits, Brushes, Mason's Gloves, and much more. A large section of masonry hammers and equipment. Offers carpentry tools from leading manufacturers. Offers timber framing term glossary. A great selection of masonry books. A great selection of masonry chisels and chisel sets made by Trow and Holden Company. Stone, brick, block, and concrete work tools and equipment. Select from more that seventy rebar cutters, including those that will cut any size rebar up to #6. Models include Electric Rebar Cutters, portable Electric and Cordless Rebar Cutters, Hydraulic Rebar Cutter, and several models that are both a Rebar Cutter & Bender. Offers a selection of hard hats, masonry tools and other equipment from leading manufacturers. Anvils, Axes & Picks, Brushes, Chisels, Cutters, Drywall Tools, Hand Planes, Handsaws, Measuring & Layout Tools,Painting Tools & supplies, Pliers, Pry Bars, Screwdrivers, Socket Sets Tool Sets, Trowels, Wrenches, and more. Air Compressors, Cordless Tools, Drill Presses, Drills, Power Generators, Lathes, Milling Machines, Nailers & Staplers, Planers, Plate Joiners, Routers, Sand Blasters, Sanders, Sawmills, Saws, Welding Equipment, and more. Accessories for and including, Abrasive Wheels, Drill Bits & Sets, Engines, Chain Saws, Cordless Tools, Grinders, Laths, Log Splitters, Polishing Pads & Bonnets, Routers, Sanders, Saws, Screwdriver Bits, Water-Pumps, and more. A picture of the North Gate on our Forestry Research Station and Tree Farm. Visit the Pacific Mountain Masonry Website Directory. Browse our masonry store catalogue of all of our construction tools, books, and equipment categories. Browse our bookstore catalogue listing for all of our book categories, including books about the medieval period weapons, warriors and castles. Plus a great selection of fireplace accessories. Visit our section for Web Search. Search the world with these popular web search engines, web directories, and select website links. Visit our main store for books, video and DVD movies, music CDs, kindle books, kindle readers, home & office electronics, computers, video games, computer and game software, cellular phones, construction equipment, power & hand tools, hardware, clothing & apparel, jewelry, footwear, games, and toys. This page was first published November 18, 2004. This page last updated January 04, 2018.